Wanna know what I like about Valentine’s Day? Chocolate. Otherwise, it’s just a normal day. Chocolate is what makes it special, makes it a celebration of love. Yes, love, because even if you don’t have a human love, you can still love chocolate. Besides, who cares about the sappy cards or flowers? And who wants to deal with thorns and vases when you can sit down, relax, and eat a truffle? I don’t normally eat a lot of sweets, so any day when I can indulge my sweet tooth in the name of love is pretty awesome. My husband knows this and spends money on the good, Belgian stuff for me every year, lest I waste my sugar coma on junk. If he didn’t do that, I would make these. In fact, I used to make truffles for myself fairly regularly before I got married. 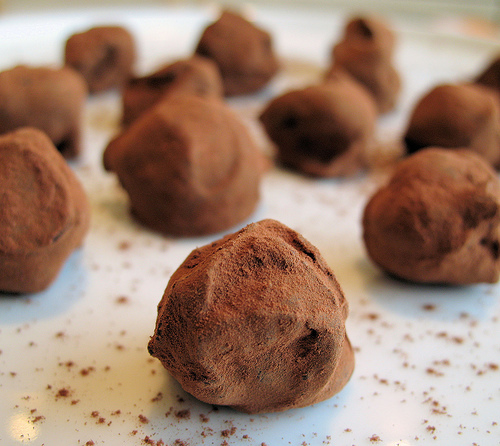 If you make your own, that means you don’t have to share and not sharing means more truffles for you. Isn’t that a delicious equation? The great thing about these truffles is that they taste like they require a ton of effort, but they don’t. That makes them DANGEROUS because, once you make them, you’ll want to make them again. And again. And again. Your tastebuds will love it. Your thighs, on the other hand, will probably ask you to join a gym with all the money you’ve saved by making your own truffles. Chop the chocolates finely with a sharp knife, then place in a heat-proof mixing bowl. Heat the cream in a small saucepan until just boiling. Turn off the heat and allow the cream to sit for 20 seconds. Pour the cream through a fine-meshed sieve into the bowl of chocolate. With a wire whisk, slowly stir the cream and chocolates together until the chocolate is completely melted. Whisk in the Grand Marnier, coffee, and vanilla. Set aside at room temperature for 1 hour.